Single pocket v-neck color block top with hatch printed panels. Pen slot and badge loop. Center back length: 29". 3-pocket v-neck zip contrast knit panel top. Modern fit. Center back length: 25½". Seamless long sleeve crew neck tee with active patterned detail with a smooth soft finish. Modern Fit. 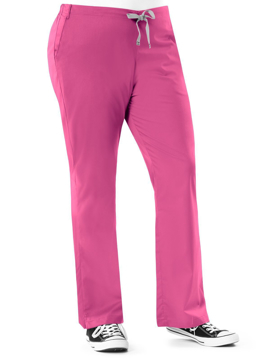 Performance features: moisture-wicking, odor control, 4-way stretch, chafe-free. Center back length: 27". Our super sporty zip-front warm up jacket is the perfect mix of warm comfort and sleek style. With large curved pockets and soft knit cuffs, you can easily transition this jacket from office wear to active wear! Center back length: 28". You know you want it! Show-stopping style is here in this Smitten crossover neckline top. Sleek bust darts for shaping, double-top entry curved pockets with instrument divider and a contrast bungee on the left pocket provides plenty of storage. Cover stitching at the arms provides a fashionable look. If that wasn't enough, side slits offer the flexibility your busy day demand. Like rock-and-roll, this top is here to stay. Center back length: 27½". 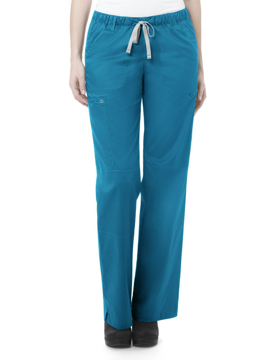 Life's too short to wear uninspiring scrubs. Become a legend in a top that puts out all the stops. Pump up your wardrobe with our notorious top. 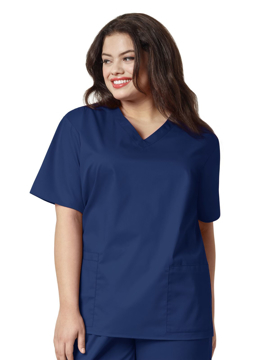 This curved v-neck seamed stunner comes equipped with storage to spare featuring six easy-access top load pockets and side vents for comfort. It's time to shake things up! Smitten style! Center back length: 25½". On the clock, she's a scrub sensation. Off the clock, she's ready to rock her wild side. This athletic-inspired V-neck with patch pockets requires the attitude and glam-packed style that only a rock goddess can deliver. Center back length: 27½". The jacket only a true Smitten groupie could love! This bomber inspired jacket is a rock star revolution, complete with dual top entry pockets on either side, rib knit collar, cuffs, and waistband. No Smitten style is complete without our signature pink logo zipper. Now you too can rock out like a member of the band in true Smitten style. Center back length: 26⅜". This cargo pants mission: comfy and practical. Making it perfect for the active you. Regular inseam: 31½". Petite inseam: 29½". 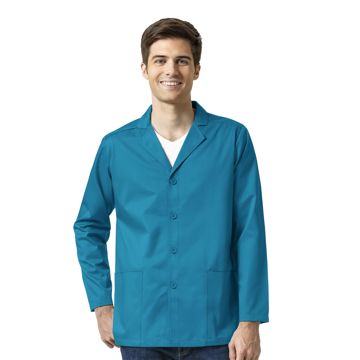 This men's blazer features forward shoulder, ID badge holder at shoulder, lapel collar, dye-to-match button closure, long sleeve, back yoke, and side vents. Center back length: 30". This straight leg cargo pant features a full elastic waist with full adjustable drawstring, front rise sits slightly below natural waist with back rise being a bit higher for more coverage. Additionally, there are two front roomy slash pockets, one back pocket, a double cargo pocket with pen pocket and utility loop, and five belt loops at waist. Regular inseam: 31". Petite inseam: 28½". Tall inseam: 33". This drawstring cargo pant by WonderWORK is designed with a special motion stretch, high thread count fabric, eliminating the unflattering 'boxy' look of scrubs and redefines it with a comfortable, natural rise and full drawstring waist. Regular inseam 31". Petite inseam 28". Tall inseam 33". 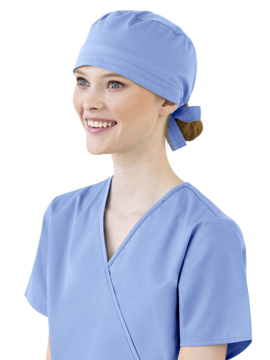 This unisex solid scrub cap features a back tie closure, covered elastic band, terry cloth sweat band, and a WonderWink logo at center back. This unisex vest featuring 2 large front pockets, forward shoulder, ID badge holder at shoulder, DTM button closures, and side vents. Center back length: 39¾". 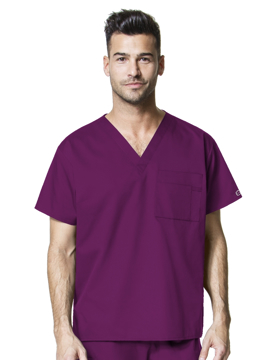 This unisex v-neck top features special motion stretch and high thread-count fabric provide smooth, durable characteristics, eliminates the unflattering "boxy" look of scrubs and redefines it with a comfortable, professional look at an unbeatable price. Center back length: 27¾". 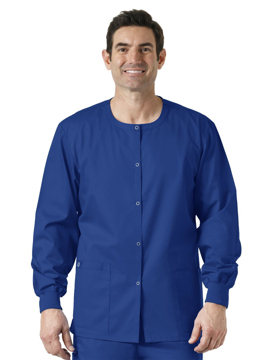 This snap front warm-up jacket is made with high thread-count fabric providing a soft, durable quality that exceeds traditional industry standards. Featuring a rounded front neckline, ample rib knit cuffs, easy front snap closure and vented sides. Center back length: 29¾". 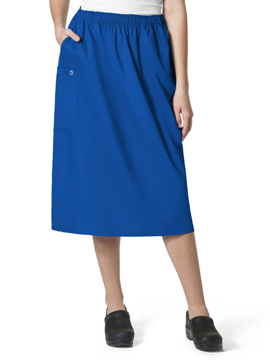 This cargo skirt features a full elastic waist, a double cargo pocket, slanted front pockets, utility loop, and pen slot. Length: 30¼". 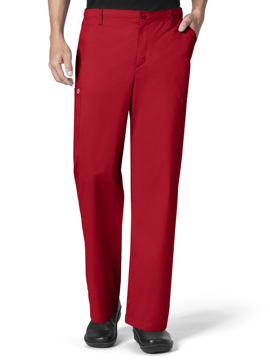 This flare leg pant is designed to create a slimming look that flatters all shapes and sizes. The vented bottoms of the flare leg are tailored to drape well over shoes. 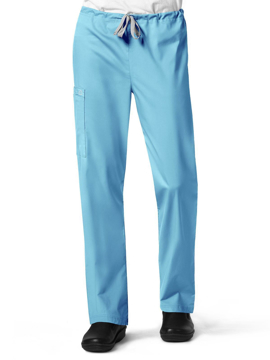 This flare pant features a full drawstring waist with a half-back elastic, higher back rise for added coverage, and includes two front roomy slash pockets as well as two back pockets. Regular inseam: 31". Petite inseam: 28". Tall inseam: 33". 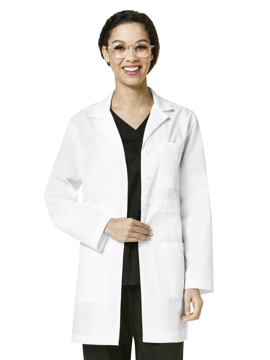 This basic lab coat with chest pocket with pen slot, two lower pockets, including one pen pocket, one cell pocket, and one inside tablet pocket, inset waistband, and back vent. Center back length: 33½". 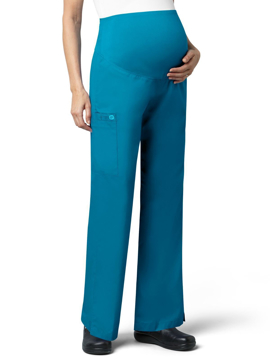 This maternity cargo pant by WonderWORK features flare leg styling, utility loop, vented bottom hem, dyed-to-match silky knit waist panel and three pockets including one large cargo pocket, one pen pocket as well as one cell pocket. Regular inseam: 31". 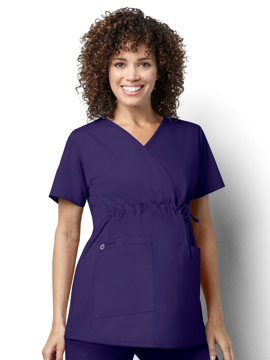 This maternity mock wrap top features dyed-to-match knit side panels for greater flexibility and movement, front waist tie, utility loop, longer front length, and four pockets including two large patch pockets, one pen pocket and one cell pocket. Center back length: 29¼". 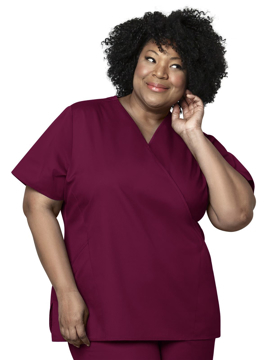 This WonderWORK mock wrap top is designed to create an instant slimming look that flatters all shapes and sizes while maintaining perfect comfort throughout the day. Princess seam lines and vented sides add even more shape for that sleek, professional look that goes above and beyond traditional industry standards at tremendous value. Center back length: 28¼". 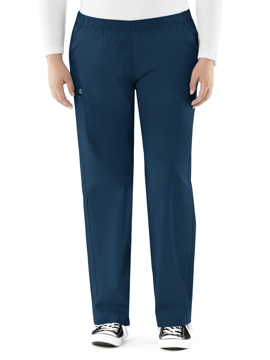 This pull-on cargo pant features an updated design with a special motion stretch, high thread count fabric and offers full elastic waistband that sits just below the natural waist with a higher back rise for ample coverage. Regular inseam: 31". Petite inseam: 28". Tall inseam: 33". 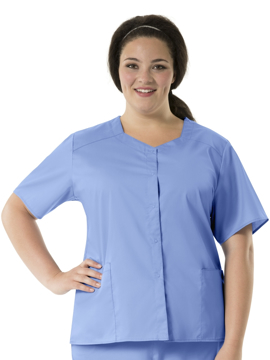 This women's smock features two large front pockets, forward shoulder, ID badge holder at shoulder, rounded collar, ¾ sleeve with optional flip cuff, princess seaming for fit, dye-t-match button closure, fit feature at inner back, and side vents. Center back length: 26¼". A short sleeve snap front top by WonderWORK that features front snaps, utility loop, vented sides, two large front patch pockets, one pen pockets and one cell pocket. Center back length: 27¾".